Summer Break, an exhibition of work by Exeter College First Year Fine Art Foundation Degree students at TAAG in Teignmouth, got off to a good start today (Saturday). There were 186 visitors to the main gallery and most of them looked at our work also. The weather was kind and there was something of a carnival atmosphere due to a live jazz band and the bustle created by a Craft Fair in Northumberland Place, immediately outside the gallery. Below are a few snaps giving of the varied work on show, which mixes pieces from the College Summer Show with other material by students. The exhibition is on daily for the rest of this week, from 10am to 4pm, until Friday 11th, if you want to pop in and check it out. 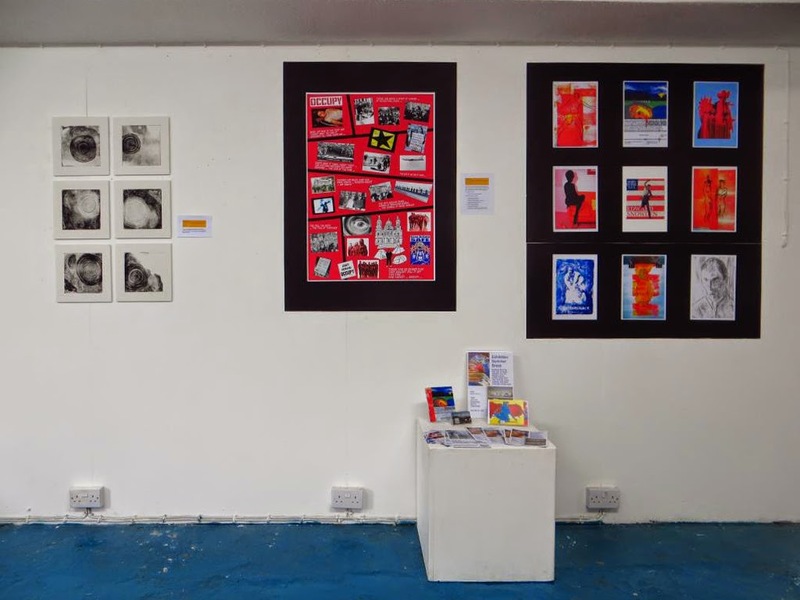 A full photographic record of the works exhibited can be accessed here. Post-exhibition update: We had a total of 540+ visitors over the seven days of the exhibition and, even though most of the exhibits were not for sale, we sold one painting and a number of postcards. Overall, great fun and a terrific learning experience.